Traditional Indian clubs rarely resemble the modern Clubbell marketed by Scott Sonnon and the RMax company. Many look like maracas with long handles, and as they get larger and heavier, the appearance takes on that of an oversized baseball bat. The Indian club shaft takes on a large diameter cylindrical shaft as the weight gets even heavier. The modern version is typically monotone, either black, red or yellow, while the antique Indian gada was painted in elaborate patterns and made of hardwoods. These weapons turned exercise equipment have a history going back thousands of years when they were used in battle and called gada. Training for use in battle eventually led to the use of these clubs as a regular form of exercise. Western culture was probably first exposed to it en masse when the British Army began incorporating Indian club training into their physical fitness routines during their occupation. Gada training is an integral part of traditional Indian wrestling stables as well (the sport is referred to as Pehlwani.) The practitioners (Pehlwan or Pahalwan) use the clubs to develop strength and endurance which carries over well to wrestling. It should be noted that the term gada is often used interchangeably with clubs in many articles. However, a gada is considered a ‘mace’ with a long handle and a large weighted ball at one end. 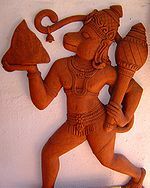 Looking at the picture here of Hanuman, it is easy to see why both terms are used. The object in his left hand is considered a gada , but is not much longer than a large club. The difference being the mace carries nearly all of its weight at the end of the lever while the club has it distributed more throughout the shaft. An antique Indian club or gada is beautiful to look at, and are becoming more popular to collect, but as they are still in use, what application do they have to sport and fitness today? What types of athletes can benefit from exercising with them and what effect do they have? First and foremost, Clubbells are a form of ballistic training which is defined by the NSCA as “overcoming a small resistance at a high speed of movement” with the emphasis on “dynamic movements with continuous acceleration throughout the range of motion.” Ballistic training also involves the use of kettlebells or medicine balls. All have the effect of improving the coordination between actively used and supporting muscles, and should improve an individual’s power output with regular use. As with kettlebells, Clubbells can be used for increasing muscle mass and strength through staple exercises like squats, presses and the like. However, continued progressive overload may be difficult to attain and these exercises are best left to tools better suited to the task. As a tool to improve muscular endurance and strength throughout the musculoskeletal system and through every plane of motion, the Clubbell has value. Here is an example routine featuring three common Indian club or Clubbell exercises, demonstrated by a member of RMax’s coaching team. The exercises are the Mill, Hammer Swings and Swipes. Before attempting these exercises, warm-up thoroughly and start out very light. Only increase the weight after your body has adapted to performing the exercise correctly. With the Mill, it is easy to see how this exercise can increase power for hip throws, throwing a football or baseball, hitting a volleyball or even throwing a punch. The hammer swings are an excellent example of improving what the NSCA calls 'coordination between agonist and antagonist muscles,' which results in improved power output. The Swipe is another exercise for improving power output, but in a range of motion easier to define; the hips and hamstrings are activated to drive the weights up and overhead, while the lats, triceps and abdominals must be recruited to send it back down again. Hammer Swings-Make sure you have plenty of room! As a stand alone workout, exercising with Indian clubs or modern Clubbells, or the gada can produce tremendous results, depending on what the trainee’s goals are. Utilizing lighter clubs, they are an effective dynamic warm-up prior to weightlifting, grappling, boxing, baseball, tennis, golf and more. To overcome the learning curve associated with this type of ballistic training, there are several good books and dvd’s available on the subject. For more information, visit the resources links below. Topics include The 7 key components of Clubbell® Training Safety guidelines and basic mechanics The 14 basic positions Detailed descriptions of the 3 Types of Clubbell® movements The 8 skill families of Clubbell® Training 82 basic exercises of this powerful system 25 sport-specific sample programs for golf, tennis, volleyball, football, baseball, soccer, and hockey. Holy cow Ken! That thing's a monster! Nice clip. Thanks Mosladder.. I find it has helped me. I'm certainitly not an expert but always look to find ways to improve. I'll look into doing a Hub. Thanks. Here's a video of the way I do that mill w two clubs. That's fantastic expert advice Ken. Why don't you do a hub on it? The way the demonstrator in the top video does the single arm Mill is not correct. he is not getting any extension when his arm crosses in front. The second to bottom demo includes a DOUBLE MILL ( one in each hand which requires tremendous coordination) and the guy extendes just a bit more than the top guy. The best way to do it is to get FULL extension so the torque increases and makes the movement more challenging and more effective.. When you've mastered single begin double swings for teh greatest benefit. awesome topic thanks for the time ! !